Story by: By Robert Uzzell and Chip Mitchell – On Saturday night, WBA Super World light heavyweight and IBF World light heavyweight champion Bernard “The Alien” Hopkins (55-6-2, 32 KOs) squares off with WBO World light heavyweight champion Sergey “Krusher” Kovalev (25-0-1, 23 KOs). The Old Man versus the Krusher. The Alien vs. The Predator. This fight has intrigued so many people, whether it is boxing fans or media, casual channel flipper or crossover observer. The media seems to be split right down the middle on who wins. So many people have an opinion about this fight. Here are two more opinions for your money. Kovalev needs to play checkers, not chess. It always puzzles me why guys with a certain style get to the big fight with a Mayweather or a Hopkins and decide to play chess. Look, I’m a fantastic chess player. If you don’t believe it and think you are better- come see me. How are you going to beat Bobby Fischer or even Deep Blue IBM at a game they are maters at playing? Yet, so many guys seem to do it. Somehow, someway after a few rounds, Bernard will begin to slow the game down and turn it from checkers into chess. Bernard Hopkins took this fight for a reason. He’s the one who became aggressive when the passive Adonis Stevenson bolted to Showtime. Hopkins broke the alleged Golden Boy/Showtime mania and made the fight, which will air on HBO. Hopkins’s problems seem to stem from guys who may be a step faster and more athletic than Kovalev. 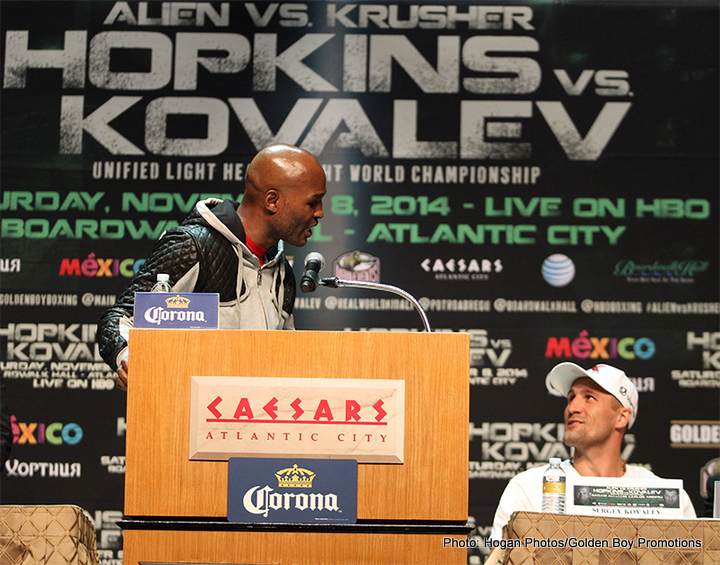 Hopkins also appears to have won the mind games that start well ahead of the actual fight. He’s in fantastic shape, and I’m not just saying that because he will be 50 years old in a few months. I mean based on pictures from his workout and from the 24/7 episode, he looks more ripped than I have ever seen. I’m not sure Bernard Hopkins would’ve taken this fight unless he sees some major holes he can expose. Maybe it’s the lack of speed, athleticism, and punch volume that Kovalev exemplifies. Maybe it’s the thought that he’s fought and dominated a similar style in his eyes (Pavlik, with maybe a side of Antwun Echols, and a sprinkle of Trinidad). Or maybe, just maybe he believes that outside of Nathan Cleverly, Sergey Kovalev hasn’t faced anyone of note. I look at his record here http://boxrec.com/list_bouts.php?human_id=505927&cat=boxer and I don’t see anything on the level of a Hopkins (20 years ago Hopkins or today’s version). I’m going with Hopkins via clear decision. Bernard “The Alien” Hopkins seems to only be worried about one thing in life and will probably only worry about that same thing for the rest of his life: R-E-S-P-E-C-T. Just a little bit. He feels that after he beats Kovalev, everyone will then say “Kovalev was never dangerous.” Just can’t win, huh ‘Heads’? While I do agree that Kovalev should stay in his lane and play checkers, he should do it with the idea of “jumping his opponent” and not looking to be “Kinged” right away. In other words, play checkers, but don’t try to win the game with one big move. Sergey hasn’t fought beyond 8 rounds in his career (a split decision win over Darnell Boone). Hopkins has gone past 8 rounds over 30 times in his career. Kovalev needs to punch, no matter if it’s elbows, shoulders, or whatever. Don’t headhunt and try to get “crowned” with one big shot. I’ve got two ways of thinking in this fight. One has to do with Kovalev being lethargic for reasons I won’t share at this time. The other has more to do with Kovalev’s stamina and Hopkins’s Father. The way I see it, I think Sergey will use the aforementioned “smart” checkers mentality and not go for the big KO with every punch. He will outwork Bernard. It won’t be easy as Bernard will tie him up, hit him in the jewels, and use every tactic that-a 49-year-old- man-who-has-forgotten-more-than-Kovalev-will-ever learn-can-think-of-using. After a precarious beginning, I think Sergey will land a hard punch that tells his psychological that “it’s alright now, I have him hurt and he’s FORTHY NINE AND A HALF YEARS OLD AND NOT AN ALIEN.” Once that happens, he will put Bernard on the defensive and win a decision. Give me Kovalev by decision.